Slow out of the gate, the No. 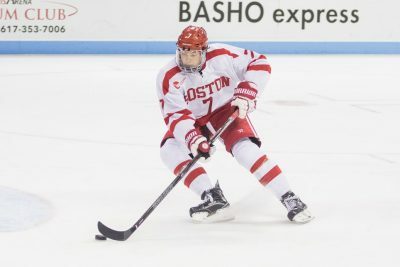 4 Boston University men’s hockey team spent the first 30 minutes of Saturday night’s clash with Northeastern University as a shell of itself. The first period was marked by BU (4-2-1, 1-0-1 Hockey East) serving eight minutes of penalty time, sophomore forward Jordan Greenway was benched for the entire stanza and Agganis Arena was lifeless. Then a spark plug by the name of Patrick Harper came around, and fortunes changed, paving the way for a 3-0 win over the Huskies (3-3-3, 0-2-1, Hockey East). Harper, a freshman forward and Nashville Predators fifth round draft pick, found himself atop the crease 10:03 into the second period. He corralled a feed from Clayton Keller, his linemate and classmate, firing past a helpless Ryan Ruck between Northeastern’s pipes. With celebrations still reeling, the Terriers cushioned their lead a mere 32 seconds later, as Charlie McAvoy showed remarkable control in the offensive zone. The sophomore defenseman used his body to create space and threw the puck towards Ruck, only for Bellows to deposit the ensuing scraps. Surging upwards, Harper capped off a tic-tac-toe sequence with 2:55 left in the second period. Keller dished for Greenway, who whipped a pass backdoor for a one-timer from the 5-foot-9 winger. Just like that, BU held a 3-0 lead, was in the driver’s seat and was well on its way to its first conference win of the season. While the Terriers’ play was more gritty than attractive, they did register their third straight shutout at home. This one required a combined goaltender effort, though. In the third period’s onset, freshman Jake Oettinger’s skate came loose, giving junior Connor LaCouvee his first appearance of the year. The veteran only reprieved the newcomer for 4:12 and they combined for 27 saves along the way, blanking Northeastern on the tail end of a 4-4 tie at Matthews Arena the night prior. Even though the Terrier faithful went home with smiles abound, BU did suffer two injuries along the way that could cause concern. Sophomore forward Ryan Cloonan reportedly suffered an upper body injury in the first period, while Clayton Keller went down in the third frame and was favoring one leg. Quinn, however, didn’t offer any insight into their statuses in his post-game press conference. Looking ahead, Quinn, as has often been in the case in 2016-17’s early goings, stressed that his young squad needs to keep on improving. After all, the Huskies owned a 27-23 shot advantage and the game wasn’t always filled with roses and sunshine. So, with a weekend series at No. 17 Michigan University now looming large, BU will spend little time resting on its laurels. In other words, three points are in the bag and then it’s right back to the drawing board.